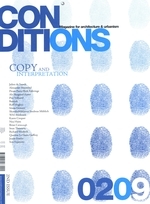 CONDITIONS, is a new Scandinavian magazine focusing on the conditions of architecture and Urbanism. Presenting new perspectives, in the way of conceiving and analyzing designs, works and theory for architecture. 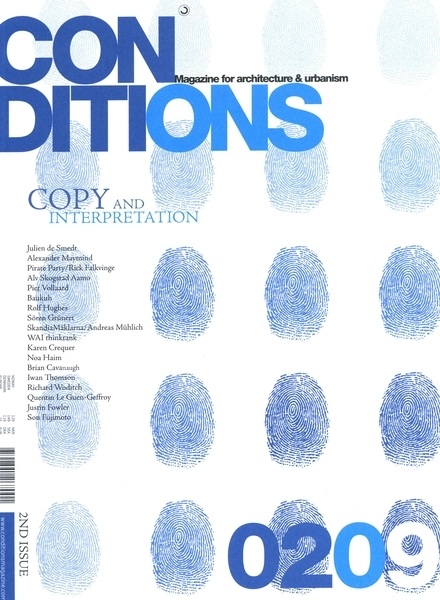 In opposition to ignorance and superficiality this magazine is conceived in order to search for knowledge and predicaments of our continuously evolving society. It is organized in a fluctuating network of agents reflecting the present globalized state of a dynamic society, economics, politics and culture which are the motivators of architecture. Through a play of thoughts in an open ended forum, predefined "facts" will be unsecured and constantly reinvented. The forum will gather the architect, client, politician and the public, a communion of ideas creating conditions for evolution.